With the regular season in the rearview mirror, the Conference Championship main slate features only four teams, severely reducing the available player pool. Despite the smaller field, each game looks exciting with both game totals above 50-points. This adds more fringe players into player pool. With that said, here are this week’s standout plays. While all quarterbacks come in underpriced on this slate, weather concerns in the Chiefs/Patriots game make Drew Brees the preferred play. Brees has shown elite play-making ability at home over the last two seasons, averaging 302 passing yards per game in the Super Dome. This game currently sits with a 56.5-point over/under, meaning the Saints should move the ball throughout this contest. Brees comes with enough upside for cash or GPPs. In the same offense, Alvin Kamara offers one of the highest ceilings at the RB position for only 6.5k. Kamara has averaged 17.5 touches per game in his last four contests, including a 20-touch performance last week. Los Angeles has been quite giving to running backs recently, allowing the sixth-most rushing yards to backs throughout the last four regular season games (461). Playing in a premier offense, with a secure role, Kamara should be prioritized in GPPs this weekend. 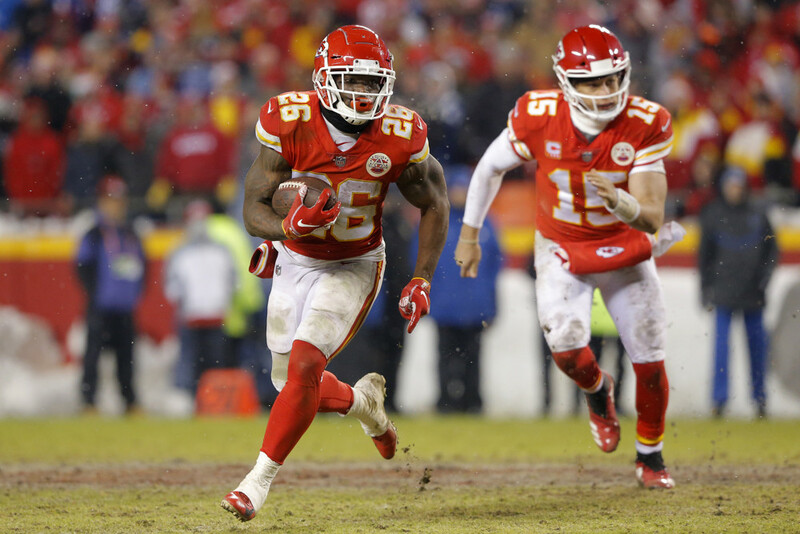 Working as the Chiefs’ clear lead runner, Damien Williams remains priced like a time share back. Williams has averaged 19.75 touches in the Chiefs’ last four games, including a monstrous 31 touch performance last week. Also seeing six targets that game, Williams has proven himself as a three-down workhorse. In a slate short on running backs, Williams deserves cash and GPP consideration. With cold weather in store and pegged as three-point underdogs, Tom Brady should lean heavily on Julian Edelman in the short passing game on Sunday. Edelman has averaged 10 targets per game in his last four contests and faces a Kansas City secondary that allowed the fifth-most yards to receivers this season. With game script working in his favor, Edelman remains a safe option across game formats. After a major let down from the Rams’ passing attack last week, Robert Woods could come in with lowered ownership on this slate. Since Cooper Kupp’s mid-season ACL tear, Woods has led the Rams in targets (60), catches (37), and receiving yards (456). Coming as 3-point underdogs with a 57-point game total, the Rams should throw far more often this week, putting Woods back into consideration for GPPs. Heading down to the bargain bin, Sammy Watkins looks like the preferred option after escaping the Divisional Round without a setback. In that game, Watkins recorded 8 targets on a 93.1% snap share. Priced as a complimentary piece, Watkins allows enough roster mobility to jam in multiple studs in all game formats. With the tight end position as unreliable as ever, paying up should provide dividends on this slate. Travis Kelce finished the season with the second most targets (148) and receiving yards (1,330) in the NFL at this tight end position. Last week proved no different, with Kelce recording 7 catches for 108 yards on 10 targets. As really the only viable tight end on the slate, paying up for Kelce makes sense.